This study was performed to investigate the relation between IgG autoantibodies against human C-reactive protein (anti-CRP) and disease activity measures in serial serum samples from 10 patients with systemic lupus erythematosus (SLE), of whom four had active kidney involvement during the study period. 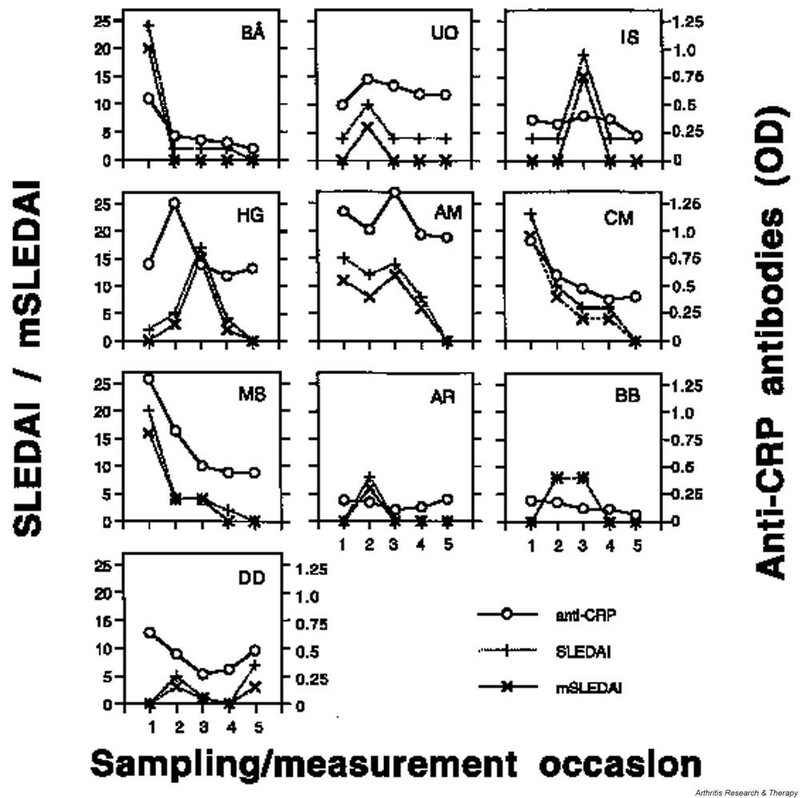 The presence of anti-CRP was analysed by enzyme-linked immunosorbent assay. The cut-off for positive anti-CRP test was set at the 95th centile of 100 healthy blood donor sera. Specificity of the anti-CRP antibody binding was evaluated by preincubating patient sera with either native or monomeric CRP. Disease activity was determined by the SLE disease activity index (SLEDAI), serum levels of CRP, anti-DNA antibodies, complement components and blood cell counts. Of 50 serum samples, 20 (40%) contained antibodies reactive with monomeric CRP, and 7 of 10 patients were positive on at least one occasion during the study. All patients with active lupus nephritis were positive for anti-CRP at flare. Frequent correlations between anti-CRP levels and disease activity measures were observed in anti-CRP-positive individuals. Accumulated anti-CRP data from all patients were positively correlated with SLEDAI scores and anti-DNA antibody levels, whereas significant inverse relationships were noted for complement factors C1q, C3 and C4, and for lymphocyte counts. This study confirms the high prevalence of anti-CRP autoantibodies in SLE and that the antibody levels are correlated with clinical and laboratory disease activity measures. This indicates that anti-CRP antibodies might have biological functions of pathogenetic interest in SLE. Further prospective clinical studies and experimental studies on effects mediated by anti-CRP antibodies are warranted. Although it is well known that hereditary as well as environmental factors are of aetiological importance in systemic lupus erythematosus (SLE), and despite a large body of information, the disease remains an enigma and continues to frustrate scientists, clinicians and patients . Deviant cytokine patterns and hormonal factors and abnormal T cell and B cell function with a wide range of autoantibodies and immune complexes (ICs) have all been implicated in the aetiopathogenesis of SLE . Recently, the roles of pentraxins, dysregulated apoptosis and deficient clearance of apoptotic material in SLE have attracted much attention [3–10]. The current view is that inefficiently removed autoantigens from dying cells are immunogenic and result in the occurrence of autoreactive lymphocytes and autoantibodies [11–14]. Apart from antinuclear antibodies, antibodies against cytoplasmic and extracellular antigens, including plasma proteins, are commonplace . Pentraxins are phylogenetically conserved pentameric acute-phase proteins that are expressed during infection, systemic inflammation or tissue damage . The family includes long pentraxins, such as pentraxin 3 produced by mononuclear cells in response to lipopolysaccharide, interleukin-1β and tumour necrosis factor-α, and liver-derived short pentraxins, namely C-reactive protein (CRP) and serum amyloid P component generated by stimulation with interleukin-6 [4, 16]. The pentraxins share several properties, including the ability to activate the complement system and to bind to apoptotic cells [4, 17]. Phosphocholine and antigens, for instance chromatin, histones and small nuclear ribonucleoproteins (snRNPs), that are targeted during systemic autoimmunity are recognised by CRP and serum amyloid P component [4, 18]. Furthermore, CRP binds ICs  and facilitates the clearance of soluble or particulate 'debris' by means of phagocyte Fcγ receptors (FcγRs) [3, 20–22]. Some of these effects can be ascribed to monomeric CRP (mCRP), which is assumed to be the tissue-based form of the acute-phase reactant . Native pentameric CRP is irreversibly dissociated into monomers when the pH is raised or lowered or in conditions with high urea and/or low calcium concentrations . Circulating autoantibodies against mCRP are commonly found in SLE [25, 26]. It is not known whether these antibodies have any biological relevance, but considering the opsonic and complement-regulating properties of CRP, there are several pathogenetic implications. The present study was undertaken to analyse circulating levels of anti-CRP autoantibodies (anti-CRP) in serial serum samples from SLE patients in relation to biochemical and clinical disease activity markers. Sera from 10 patients with SLE who were taking part in a prospective control programme at the Department of Rheumatology, Lund University Hospital, Sweden, were studied. Serial serum samples were drawn on five different occasions and the sera were kept frozen (at -70°C) until analysed. Clinical characteristics are summarised in Table 1. The median number of ACR criteria was seven (range four to nine) and the mean age when entering the study was 38 years (range 10–69 years). Nine of the 10 patients were women. 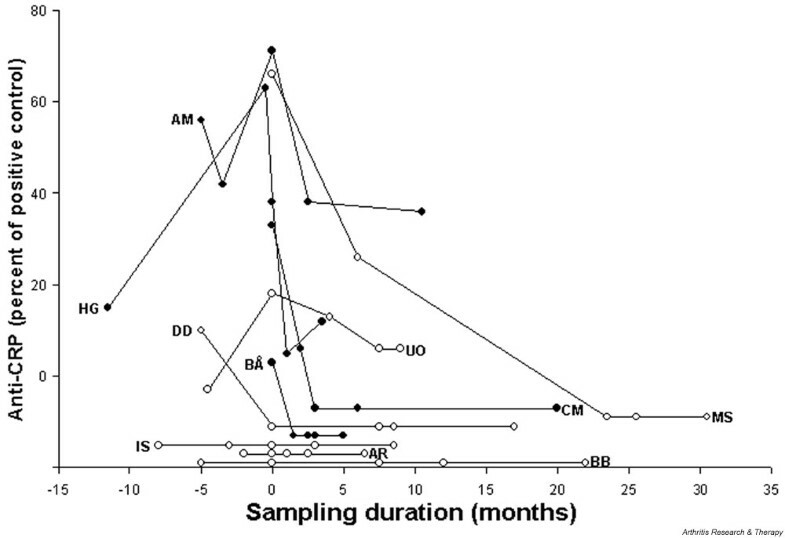 Four of the 10 patients (identified as BÅ, HG, AM and CM) had active kidney involvement with proteinuria (more than 0.5 g of albumin per 24 hours), haematuria and/or cellular casts by urine analyses at some time during the study. ACR criteria are as follows: 1, butterfly rash; 2, discoid lupus; 3, photosensitivity; 4, oral ulcers; 5, arthritis; 6, serositis; 7, renal disorder; 8, neurological disorder; 9, haematological disorder; 10, immunological disorder; 11, antinuclear antibody. Daily medical treatments: Am, antimalarials; Aza, azathioprine; Cy, cyclophosphamide; Cyclo, cyclosporine. ACR, American College of Rheumatology; CVI, cerebralvascular insult. On the occasion of each blood sampling, disease activity was assessed by the SLE disease activity index (SLEDAI) . The index was also modified (mSLEDAI) by the exclusion of laboratory items (complement and antibodies against double-stranded [ds] DNA). All patients showed signs of disease activity defined as a SLEDAI peak score of at least 7 (median 16) for a median time of 16.1 months (range 5–27 months). The term 'flare' was used to describe the time-point of highest mSLEDAI score. Treatment with prednisolone, antimalarials, azathioprine, cyclosporine A and cyclophosphamide was recorded. No other corticosteroid-sparing agents were prescribed. In seven patients, one or two samples were obtained before the time-point of flare. The remaining three patients were admitted with recent-onset disease and high disease activity, and in these cases no 'pre-flare' samples were available. In all patients, at least two samples were obtained after flare. One hundred sera from healthy blood donors (50 women, 50 men; mean age 36 years) served as controls. Laboratory tests included serum measurements of CRP, complement components (C1q, C3 and C4), anti-dsDNA antibodies, blood cell counts and urinary analyses. Anti-dsDNA IgG antibodies were measured with three different methods: Farr assay (DPC/Skafte Mölndal, Sweden), a commercial enzyme-linked immunosorbent assay (ELISA; Euroimmun, Lübeck, Germany) and an 'in-house' ELISA based on plasmid DNA . CRP was measured by turbidimetry, and C1q, C3 and C4 were determined by electroimmunoassay. IgG-class antibodies against nucleosomes were measured as described by Mohan and colleagues . Successful coating of ELISA plates with a DNA-histone complex was confirmed by strong positive reactions with a monoclonal mouse anti-nucleosome antibody (B6. Sle-1), which was a gift from Dr Chandra Mohan (University of Texas Southwestern Medical Center, Dallas, TX, USA). IgG antibodies against CRP were determined essentially as described previously . In brief, 96-well microtitre plates (Immulon 2; Dynatech Labs, Chantilly, VA, USA) were coated overnight at room temperature with native human CRP (Sigma, St Louis, MO, USA) in carbonate–bicarbonate buffer (pH 9.6) at a concentration of 1.0 μg/ml. Such binding of CRP to polystyrene surfaces has been shown to cause conformational changes exposing non-native regions of the pentameric CRP molecule, namely mCRP, unless the plates are precoated with phosphocholine bound to keyhole limpet haemocyanin . Patient sera, diluted to a standard concentration of 0.3 mg/ml IgG in phosphate-buffered saline (PBS) containing Tween, were added in triplicates and incubated for 60 min. An alkaline-phosphatase-conjugated rabbit anti-human IgG, specific for γ-chains (Dako, Glostrup, Denmark) diluted 1:500 in PBS–Tween, was added to each well and plates were incubated for 60 min. The substrate, p-nitrophenyl phosphate (Sigma), diluted to 5.7 mM in deionised water, was added to each well and the plates were incubated in a dark room for 60 min at 20°C. Optical densities (ODs) were measured at 405 nm and results were expressed as a percentage of a positive reference sample from an SLE patient at flare ('SLE reference') or as the OD. The cut-off value for positive result was calculated from the 95th centile obtained in the control material. The SLE reference was always included. All results refer to the net OD after subtraction of the background OD obtained on uncoated plates. To avoid systematic errors, the samples from SLE patients and those from controls on the microtitre plates were always randomly mixed and analysed at the same occasion. Eleven patient sera with strong reactivity regarding anti-nucleosome antibodies as judged by our assay were used for blocking experiments. The sera were preincubated overnight with increasing concentrations of a mixture of dsDNA (Pharmacia Biotech, Uppsala, Sweden) and total histones (Sigma) in the same proportions as that used for microtitre plate coating in our anti-nucleosome antibody ELISA . Patient sera diluted 1:100 in PBS–Tween were compared with sera preincubated overnight with DNA–histones in PBS–Tween. The samples were then analysed by a commercial anti-nucleosome antibody kit (Anti-Nucleo; GA, Dahlewitz, Germany), using isolated nucleosomes as the source of antigen. Human CRP (Sigma) was modified by treatment with 8 M urea and 10 mM EDTA as described by Kresl and colleagues . The preparation was then dialysed with Slide-A-Lyzer (Pierce, Rockford, IL, USA) versus Tris–HCl buffer (pH 8.0), and finally centrifuged at 800 g for 10 min. The capacity of urea/EDTA-modified CRP and native CRP to block antibody binding to solid-phase CRP in sera was measured by adding increasing amounts of native or mCRP to 11 anti-CRP positive sera. Sera were diluted 1:100 and analysed in quadruplicate but were otherwise treated as described above. According to the manufacturer, human plasma was the source of CRP, which had been isolated by gel chromatography and had a purity of at least 99% as measured by SDS-PAGE. We also checked the CRP preparation by polymerase chain reaction (PCR) technique for potential DNA contamination . No DNA was detected. However, the CRP preparation was found to decrease the PCR detection limit for DNA to 0.2%, meaning that at most 0.2 ng of DNA could have been present in the antigen-coated microtitre plates (0.1 μg of antigen preparation/well). Correlations were calculated with Spearman's rank correlation, and differences between groups were calculated with the Mann–Whitney U test. Informed consent was obtained from each patient and the study protocol was approved by the local ethics committee. As seen in Fig. 1, IgG reactive with human CRP was detected in 20 of 50 serum samples (40%). Seven of 10 patients were positive on at least one occasion, whereas three patients were consistently anti-CRP negative. Six of 10 patients were anti-CRP positive at flare (Fig. 2). In three patients (HG, AM and DD), elevated levels of anti-CRP preceded the flares (Fig. 3), whereas pre-flare samples were not available for three patients (BÅ, CM and MS). No significant differences in anti-CRP reactivity were found between women and men in the controls (P = 0.7). Three of five control sera that fell outside the 95th centile originated from male blood donors. Results of the anti-C-reactive protein autoantibody (anti-CRP) analyses. Twenty of 50 systemic lupus erythematosus (SLE) sera were positive; 7 of 10 patients were positive on at least one occasion. Positive samples are indicated by filled circles, negative samples by open circles. The positive control (SLE reference) sample was defined as 100%. All samples below 0% were considered negative. Sampling duration and anti-C-reactive protein autoantibody (anti-CRP) levels are expressed as a percentage of the positive control on the y-axis. Negative values on the x-axis indicate pre-flare samples, and positive values post-flare samples. Zero on the x-axis marks the time-point of flare. All samples below 0% on the y-axis were considered negative. Six of 10 patients were anti-CRP positive at flare. Patients with active kidney involvement at the present flare are indicated by filled circles, patients without kidney involvement by open circles. Four of four patients with ongoing nephritis were anti-CRP positive at flare. Relations between anti-C-reactive protein autoantibody (anti-CRP) levels and systemic lupus erythematosus disease activity index (SLEDAI)/modified SLEDAI (mSLEDAI) scores in the 10 SLE patients. Anti-CRP results are given as optical density (OD). In three cases (HG, AM and DD), high levels of anti-CRP preceded the peak mSLEDAI score. All patients with active kidney involvement were anti-CRP positive at flare, whereas four of six patients without ongoing kidney involvement were anti-CRP negative at flare (Fig. 2). None of the three consistently anti-CRP-negative patients (IS, AR and BB) showed signs of nephritis during the study period (Table 1). Generally, AR and BB had a milder form of disease with no history of nephritis, fewer ACR criteria, low anti-DNA levels and SLEDAI scores, but did not otherwise differ from other patients in medication, CRP levels or antibody profiles (not shown). In two of the anti-CRP-positive sera, signs of weak non-specific IgG binding to the plastic surface of the microtitre plates were found. However, the ODs achieved on uncoated wells were much below the values obtained on CRP-coated plates, and all results refer to differences between ODs obtained on coated and uncoated plates. Table 2 illustrates the associations between anti-CRP levels (OD) and the different clinical and laboratory disease activity measures on both individual and collective bases. With accumulated data, positive correlations were found for SLEDAI, mSLEDAI and anti-dsDNA antibody levels, and significant inverse relations were noted for complement factors C1q, C3 and C4, and with lymphocyte counts. Each anti-CRP-positive individual showed correlation with at least one variable, and patients with nephritis tended to have more and stronger correlations. Results (P values) are presented at the individual level and for the whole patient material (n = 10). Positive correlations are given as bold P values and inverse correlations are shown in italics. The three consistently anti-CRP-negative cases are asterisked. In the last column, '4/7 anti-CRP+', for example, means that four of seven anti-CRP-positive patients had anti-CRP levels correlating to this particular variable. anti-CRP, anti-C-reactive protein autoantibody; CRP, C-reactive protein; mSLEDAI, modified systemic lupus erythematosus disease activity index; n.s., not significant; SLEDAI, systemic lupus erythematosus disease activity index. The capacity of native CRP and mCRP, respectively, to block antibody binding to microtitre plate-bound CRP were studied in 10 anti-CRP-positive SLE sera plus the SLE reference sample and is shown in Fig. 4a. 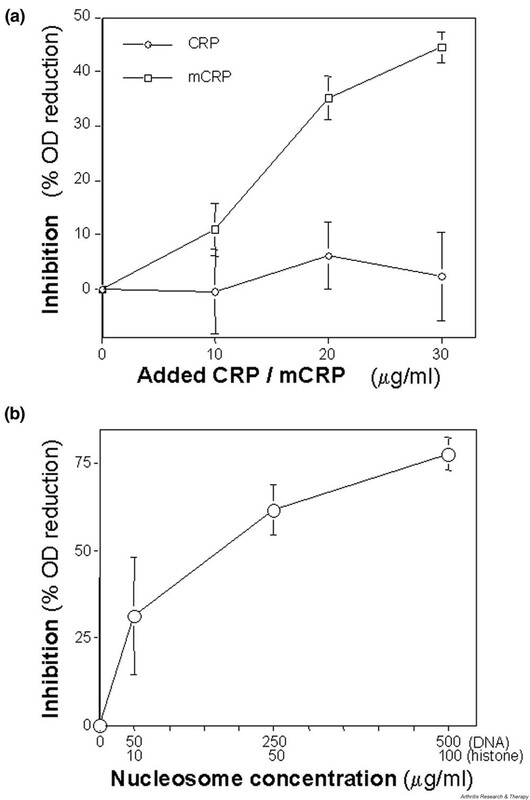 Soluble native CRP showed no capacity to inhibit anti-CRP binding, whereas mCRP caused a dose-dependent decrease in antibody binding. Results of the inhibition assays. (a) Statistically significant differences (P < 0.001) were seen in all three concentrations between C-reactive protein (CRP) and monomeric CRP (mCRP) considering the ability to inhibit anti-CRP binding, indicating that anti-CRP autoantibodies are targeted to the monomeric form of the acute-phase protein. (b) Increasing concentrations of soluble DNA–histones showed a dose-dependent decrease in anti-nucleosome antibody reactivity. Statistically significant differences (P < 0.001) between each concentration of DNA–histones were seen. OD, optical density. The levels of anti-CRP did not correlate with the levels of anti-nucleosome antibodies (r = 0.0136), indicating that anti-CRP does not reflect antibodies against nucleosomes (not shown). Furthermore, preincubation of anti-nucleo-some antibody-positive patient sera with DNA–histone solution resulted in a dose-dependent reduction of reactivity in the commercial anti-nucleosome antibody ELISA (Fig. 4b). The SLEDAI is helpful in assessing disease activity , and Systemic Lupus International Collaborating Clinics (SLICC) scores are of use in estimating disease severity and damage due to medical side-effects . Although analysis of complement factor C1q and antibodies against dsDNA can be helpful [15, 32], there is a need for reliable biochemical markers of disease activity in SLE. Acute-phase reactants, such as CRP and serum amyloid A, are far better markers of disease activity in rheumatoid arthritis than in SLE . When we recently confirmed Bell's finding of autoantibodies against mCRP in SLE sera , we noticed that some patients were anti-CRP positive on one occasion and negative on another . This raised the question of whether anti-CRP levels might vary over time and be associated with disease activity or flares, and/or certain disease manifestations. Although the material in this study is limited to 50 samples from 10 patients, many interesting observations were made. Generally, the serum levels of anti-CRP paralleled the clinical disease activity, usually with high levels at the time-point of flare. Both individually and collectively, significant correlations were found between anti-CRP levels and several clinical and laboratory disease activity measures, namely serum levels of anti-DNA antibodies, complement factors C1q, C3 and C4, and SLEDAI scores, regardless of whether complement components and anti-DNA antibodies were included (Table 2). Strong correlations were found, especially in individuals with kidney involvement. In our previous study we did not find an association with anti-DNA antibody levels . The reason for this can be sought both in methodological differences for anti-DNA antibody detection and in the different selection of patient sera. Patients with SLE often show elevated serum levels of nucleosomes [14, 33], and because CRP binds to several nuclear structures , including nucleosomal antigens, it could be argued that anti-CRP in reality might reflect interactions between circulating nucleosomes and anti-nucleo-some antibodies. However, our data strongly argue against this possibility. Correlation analysis showed no association between anti-CRP and anti-nucleosome antibody reactivity. Furthermore, no DNA was detected in the CRP preparation. This, together with the fact that all three consistently anti-CRP-negative patients (IS, AR and BB) were anti-DNA antibody positive in 12 of 15 serum samples, makes the chance that anti-CRP actually reflects anti-DNA antibodies negligible. 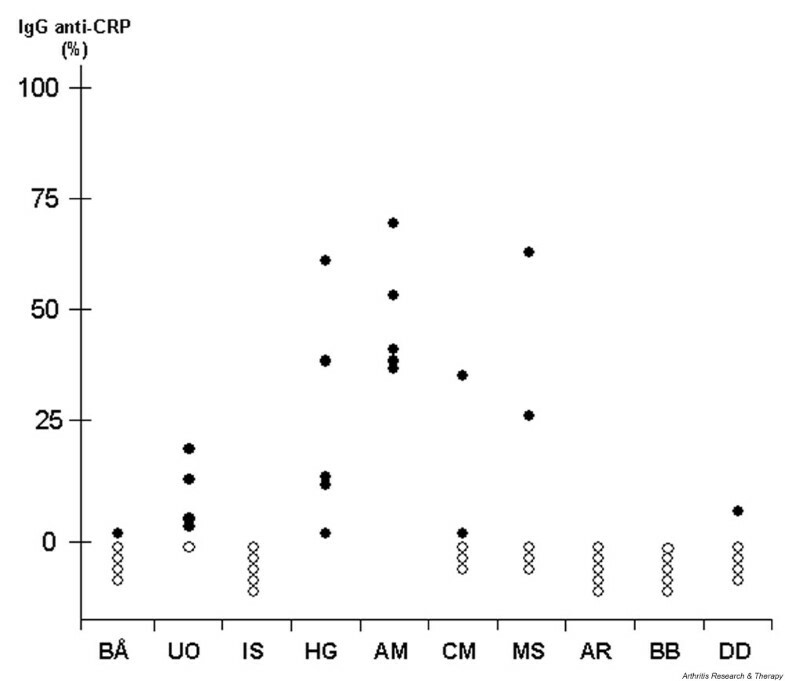 In conformity with earlier studies [25, 26], the detected anti-CRP antibodies do not bind native pentameric CRP and are not correlated with circulating levels of CRP. Others have shown that the limited CRP response seen in SLE, despite active disease, is due to deficient production rather than increased consumption . Kidney involvement often results in more pronounced discrepancies between CRP and disease activity . However, the very low CRP levels seen in SLE patients with glomerulo-nephritis, often contrasting with levels of other acute-phase reactants, might in fact be due to the consumption of CRP by ICs . With this in mind we find the high frequency (4 of 4) of anti-CRP in patients with ongoing kidney involvement interesting, given the pathogenetic implications of ICs in lupus nephritis, but extended studies on larger materials are needed. Prospective studies are also needed to evaluate whether changes in anti-CRP levels can predict disease flares. It is open to speculation whether the presence of anti-CRP autoantibodies is merely an epiphenomenon or whether it actually reflects events of pathogenetic interest. The binding of CRP to cellular FcγRs is believed to account for its opsonising properties; pentameric CRP binds primarily to the low-affinity FcγRIIa (CD32) and to some extent to the high-affinity FcγRI (CD64), whereas mCRP binds to the low-affinity FcγRIIIb (CD16) [3, 20, 36, 37]. It is conceivable that mCRP exposed on cellular surfaces might be a target for anti-CRP. In this connection, and in view of earlier findings of mCRP expression on human peripheral blood lymphocytes [38, 39] and accelerated apoptosis of lymphocytes from SLE patients , we find the inverse relation between high anti-CRP levels and lymphopenia interesting. Hypothetically, this correlation might result from an opsonisation of lymphocytes expressing mCRP on their cell surface, leading to increased elimination through the reticulo-endothelial system. Defective clearance of apoptotic debris, including nuclear constituents, is most likely to be important for the persistence of autoantigens in SLE [2, 12–14, 22, 33, 40]. High levels of apoptotic peripheral blood mononuclear cells have been shown in SLE patients , whereas correlation with disease activity scores has been reported only for apoptotic neutrophils . The functions of CRP include binding to, and clearing from the circulation, chromatin, nucleosomes and snRNPs [4, 21, 22]; that is, nuclear antigens to which antinuclear antibodies are commonly targeted . Binding of autoantibodies to their target antigens results in the formation of ICs in situ and/or in the circulation. Under normal conditions, circulating ICs are eliminated through the liver after complement-mediated binding to erythrocytes [43, 44]. Deficient complement-mediated IC handling increases the risk of extra-hepatic IC deposition and subsequent complement-mediated inflammation of the affected tissues . CRP facilitates the clearance of ICs and apoptotic debris by FcγR-mediated uptake in phagocytes [20, 36], and when the tissue microenvironment becomes acidic owing to inflammation, CRP is dissociated to mCRP, which further enhances the binding of ICs to FcγRs . In addition, by binding C1q, CRP has complement-activating properties, which also promote IC clearance [3, 4, 11]. Speculatively, anti-CRP autoantibodies could interfere with the physiological mCRP-mediated removal of IC and/ or nuclear constituents [4, 19, 36, 40]. Further prospective clinical and experimental studies aimed at investigating biological effects of anti-mCRP are merited to elucidate these questions further. In this study of well-characterised patients we confirm the high prevalence of autoantibodies against monomeric CRP in SLE and show that the antibody levels are correlated with most disease activity measures. This indicates that anti-mCRP might have functions of pathogenetic interest in SLE. We thank Chandra Mohan for generously providing antibodies for the anti-nucleosome antibody assay, Mats Fredikson for statistical consultation, Martin Sturm for laboratory assistance, Peter Söderkvist and Anette Molbaek for DNA determination in the CRP preparation, and Lawrence A Potempa for valuble discussions and fruitful cooperation. The study was supported financially by grants from the Swedish Rheumatism association, the Swedish Research Council (project numbers 13489 and K2003-74VX-14594-01A), the County Council of Östergötland, King Gustaf Vth 80-year foundation, Alfred Österlund's foundation, Johan Kock's foundation and Siv Olsson's research foundation.